This morning we walked Murphy on the beach. 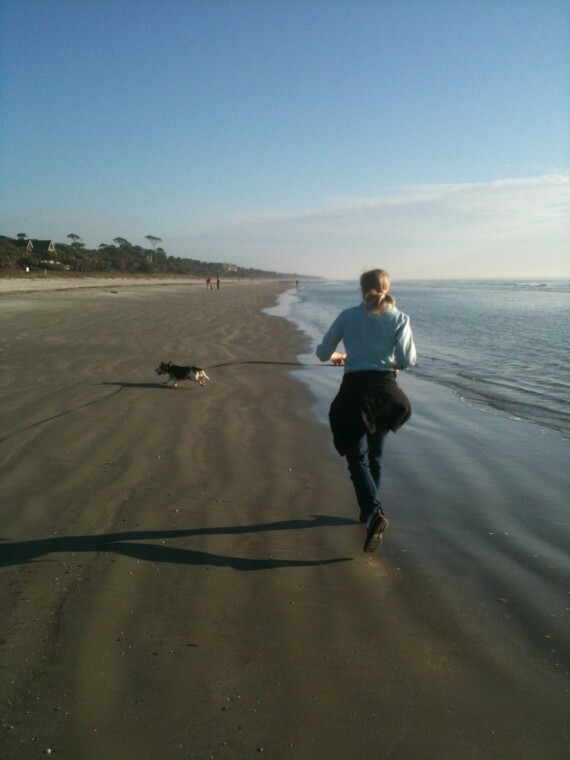 January at Hilton Head is “low season,” so the beach was almost deserted. It was also low tide, but with bright sun and warm air. A few people strolled between the remnant dunes and winter ocean and we even let the dog off the leash. In high season Murphy would only be welcome early morning and late evening on the Hilton Head beach, the heat of the day reserved for paying human sun worshippers. On these visits I’m often uncomfortable with the idea of Sea Pines. It’s the tension that’s always present between compassion and privilege, and I thought about that tension as we walked south among all the dying and dead star fish. I reached down and tossed one back and I looked out to sea and thought about eternity, as I knew Loren Eisleley would expect me to do. My lack of ease with Sea Pines is economic and social in origin. I was once a poor kid and I am no longer. There’s tension in the distance between who I was and who I am now. I grew up in an environment where resources were scarce, a cash desert, so the forces that shaped this island’s society since the 1960s were foreign to me most of my life. I still don’t understand them but I see that the wealth bubble of the past forty years has been glacial in its immensity. If all money locked up on Hilton Head in real estate, cash, securities, and stocks were ice, the burden on this island would be a mile high like the ice sheet now covering Greenland. But glacial ages pass and with the last decade’s thaw it’s possible that Hilton Head (and Sea Pines) could be seen in the future as a sort of terminal moraine left by the remarkable wealth and privilege. Fraser’s been dead now for a decade. He lost control of the vision of Sea Pines Plantation (now known as Sea Pines “Resort”) in the 1980s and soon after that it changed hands many times. Fraser’s stock has risen. He is now considered an early visionary, a golden age grandparent of the “sustainability”/new urbanism movement, even the inventor of the modern resort style, but Sea Pines has followed other resort models through the years after a bankruptcy or two. Fraser’s original vision of the forest preserve, a thousand acre green space in the middle of the development, has been legally compromised, and many of the development’s original design standards have been relaxed. Everybody carries around in their head clichéd phrases that prop up their world view. Two chestnuts I often trot out are William Faulkner’s “The past is not dead, sometimes it isn’t even past,” and one I often attribute to the Shakers, “Every force evolves a form.” Both echoed in my brain when I looked up at the two houses in the dunes at Sea Pines, and each made my heart ache in a different way. The old Sea Pines is a past that was capable of dying, and the force of the free market over the last forty years has evolved this ugly form of this current row of beach front houses. When Murphy changed course again I looked away from the dunes and the line of contemporary houses there– surviving constructions from the quickly passing human financial bubble. When I looked the other way, out at the ocean, I saw a hint of eternity–time and tides. To stand next to the ocean is to be in touch with these eternal cycles of nature, but also with some base human cycles as well. Maybe that’s the whole point of vacation, to bring up such stark contrasts. Maybe that’s all that really matters. If you focus on the star fish and throw a few back you can glimpse eternity, in spite of the ugliness of the first row of new houses back from the dunes. I’ve been visiting Hilton Head since the early 1970’s. In fact, I own a house there now, inherited from my husband’s parents on Folly Field. It’s one of the original 1950’s beach houses. Next time you venture down to the island, maybe you can come by our place and escape the ugly plantations. The original Folly Field community is disappearing too, but there are still some of the older, small beach cottages around. I remember going with Lee’s uncle Bob to crab and fish in what is now Port Royal. We would put in the small homemade dingy and set the crab pots, anticipating the delicious feast that arrived on the next tide. I’m glad that my children grew up going to Hilton Head when it was still possible to roam the dirt paths and bike the island without all of the tourists getting in the way! But the real beauty of the island is the eternal ocean, the quick pipers and floating gulls, the dunes and ghost crabs. The ancient horseshoe crab still visits the sands. The Folly still carves its way into and out of the island twice daily with the tide’s flux.